At present moment many ideas on improvement of the activities of mechanisms of universal human rights system are put forward. The creation of the world court of human rights is regarded as one of the most ambitious among these ideas. It is supposed that the establishment of this judicial body would solve difficulties facing this system, including its main component - human rights treaty body system. However, it seems that this suggestion should be taken carefully, since it is crucial to avoid decrease in the effectiveness of the work of the universal human rights system in the result of the changes that would be brought to its activities by the creation of world court of human rights. In this respect in frames of this article the author analyses the proposal of creation of world court of human rights in order to determine its advantages and disadvantages in terms of its capability to enhance effectiveness of functioning of universal human rights system, including human rights treaty bodies. The author identifies key stages in the history of formation of this idea, paying special attention to its development in the context of the process of strengthening the human rights treaty body system as well as determines and critically analyses the main arguments justifying the necessity and effectiveness of creation of world court of human rights. On the basis of the analysis, the author, using arguments of conceptual and practical character, justifies the futility of this initiative at present stage of development of universal human rights system. Considering that the non-amendment of the legal foundations of the functioning of the human rights treaty bodies constitutes the basic requirement of the ongoing treaty body strengthening process, a more effective, than the creation of world court of human rights, mechanism of improving the human rights treaty body system is proposed. This mechanism provides the adoption of measures targeted at strengthening the procedures of the human rights treaty bodies, improving the quality of their recommendations in terms of argumentation and legal clarity. Such an approach is more flexible and has chances to get more support on the side of the treaty bodies themselves, who consider the issues of their competence being most sensitive, as well as on the side of the States Parties. international law, human rights, universal human rights system, human rights treaty body system, world court of human rights, strengthening human rights treaty body system, UN Human Rights Council, Universal Periodic Review. Glendon MA. A World Made New. Eleanor Roosevelt and the Universal Declaration of Human Rights. New York: Random House; 2001. xxi and 333 p.
Abashidze AKh, Koneva AE. Dogovornye organy po pravam cheloveka [The human rights treaty bodies]. 2nd ed. Moscow: RUDN; 2015. 437 p. (In Russian). Alston Ph. Against a World Court for Human Rights. Ethics & International Affairs. 2014;28(2):197–212. doi: 10.1017/S0892679414000215. Nowak M. Eight Reasons Why We Need a World Court of Human Rights. In: Zayas A, Alfredsson G, Ramcharan BG, Grimheden J, editors. International Human Rights Monitoring Mechanisms. Essays in Honour of Jakob Th. Möller. 2nd rev. ed. Leiden, Boston: Martinus Nijhoff Publishers; 2009. p. 695–706. doi: 10.1163/ej.9789004162365.i-728.357. Ulfstein G. Do We Need a World Court of Human Rights? In: Engdahl O, Wrange P, editors. Law at War: The Law as it Was and the Law as it Should Be. Leiden, The Netherlands: Koninklijke Brill BV; 2008. p. 261–272. [cited 2016 Nov 10]. Available from: http://ulfstein.net/wp-content/uploads/2012/08/UlfsteinWorldCourt2008.pdf. Ssenyonjo M. Conclusion: Towards a World Court of Human Rights. In: Ssenyonjo M, editor. Economic, Social and Cultural Rights in International Law. Oxford, Portland, Oregon: Hart Publishing; 2009. p. 401–406. doi: 10.5040/9781472564818.ch-010. Schmidt M. Follow-up Procedures to Individual Complaints and Periodic State Reporting Mechanisms. In: Alfredsson G, Grimheden J, Ramcharan B, Zayas A, editors. International Human Rights Monitoring Mechanisms. Essays in Honour of Jakob Th. Möller. The Hague, London, Boston: Kluwer Law nternational; 2001. p. 201–216. Müllerson R. Prava cheloveka: idei, normy, real'nost' [Human rights: the ideas, norms, reali-ty]. Moscow: Yuridicheskaya literatura; 1991. 160 p. (In Russian). Nowak M. The Need for a World Court of Human Rights. Human Rights Law Review. 2007;7(1):251–259. doi: 10.1093/hrlr/ngl026. Abashidze AKh, Keburia ChO, Solntsev AM. The Legal Analysis of the Right to Reparation for the Victims of the Human Rights Violations in the European, Inter-American and African Human Rights Protection Systems. Indian Journal of Science and Technology. 2016;9(37). Available from: doi: 10.17485/ijst/2016/v9i37/102173. [Accessed 12th November 2016]. Koneva AE. Cooperation Between Human Rights Treaty Bodies and Regional Human Rights Mechanisms. 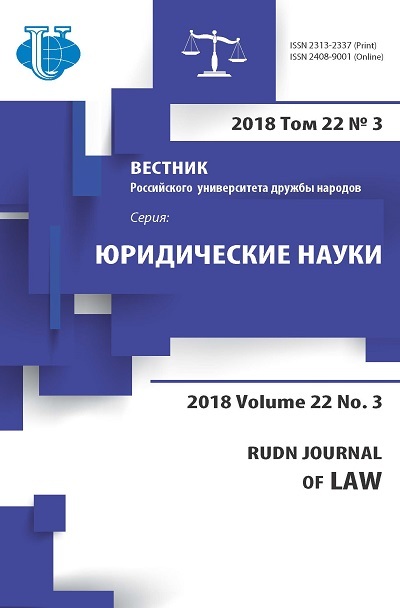 Eurasian Law Journal. 2014;(11):47–51. Abashidze AKh. Institutsional'nye probely v universal'noi pravozashchitnoi sisteme kak faktor negativnogo vliyaniya na effektivnost' raboty sistemy dogovornykh organov po pravam cheloveka [The Institutional Gaps in the Universal Human Rights System as a Factor of the Negative Impact on the Effectiveness of the System of Human Rights Treaty Bodies] In: Sumus ubi sumus. Mezhdunarodnoe pravo XXI veka: mir i bezopasnost', sotrudnichestvo, prava cheloveka: LIBER AMICORUM v chest' professora Lyudmily Petrovny Anufrievoi [In-ternational Law of the XXI Century: Peace and Security, Cooperation, Human Rights: LIBER AMICORUM to Honor of Professor Lyudmila Petrovna Anufrieva]. Moscow: Prospekt; 2016. p. 54–67. (In Russian).